Yasiel Puig was arrested last month after he was clocked traveling 110 mph in a 70-mph zone. 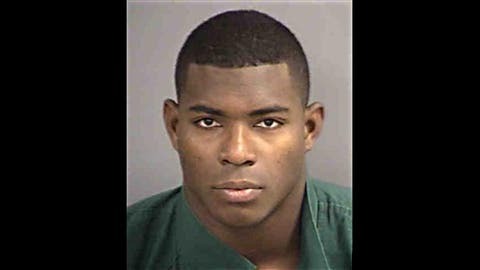 Florida authorities have dropped a reckless-driving charge against Dodgers outfielder Yasiel Puig, the state attorney’s office announced Tuesday. 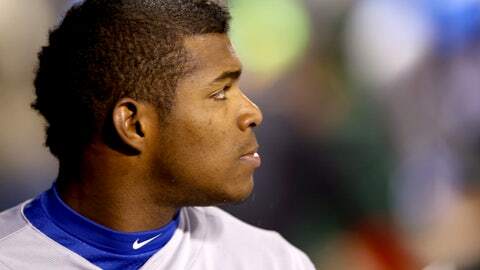 Puig was arrested last month after his Mercedes-Benz was clocked traveling 110 mph in a 70-mph zone, officials said. A video of the arrest, which became public, showed the Florida Highway Patrol officer on the scene becoming incensed when discovering Puig’s mother was in the vehicle. However, in speaking with the officer, the state attorney’s office said it determined that on the morning of the incident, traffic was "moderate to light," the weather was clear and the roads were dry. Also, the office said, Puig wasn’t observed weaving in and out of traffic or losing control of his vehicle, was sober and had a valid Florida driver’s license. As a result, it said, officials determined that there was insufficient evidence to charge Puig with reckless driving. However, the decision doesn’t affect the speeding ticket Puig received that morning. After the incident, the Dodgers issued a statement in which they said they were disappointed in Puig. The outfielder has since hired a driver. This marks the second time a reckless-driving charge against Puig has been dropped. He was also arrested in April while playing for the Dodgers’ double-A affiliate in Chattanooga, Tenn.
Puig, who authorities said was driving 97 mph in a 50-mph zone, was charged with speeding, reckless driving and driving without proof of insurance. The charges were dismissed last month, in large part because of community service he performed in Los Angeles.